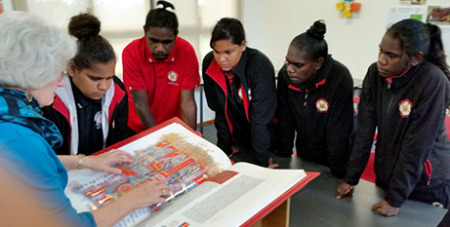 The links between the Catholic faith and Aboriginal spirituality were explored during a designated religious education week at Perth’s Clontarf Aboriginal College. Source: The eRecord. The RE Week, held last month, followed the success of last year's inaugural at the Edmund Rice school. The aim was to celebrate religious education and its broad diversity of topics with various links between the Catholic faith and Aboriginal spirituality presented through guest speakers, activities, and events. Guests included Perth Archbishop Timothy Costelloe SDB, Auxiliary Bishop Don Sproxton, The University of Notre Dame's Angela McCarthy, boxer and Stop the Coward's Punch campaigner Danny Green, and Nyungar/Palkyl woman and traditional owner Vanessa Corunna. RE Week Coordinator Salvatore De Luca said the topics covered included Aboriginal culture, healing, spirituality, inclusion, personal faith testimonies, life experiences, social justice issues, and theology. “It was such a fantastic week and one to remember,” Mr De Luca added. Activities took place in other learning areas as well with students commencing mathematics and literacy classes with RE-based activities and the students participated in the campus-wide Clontarf Amazing Race. Other highlights included a visit to Prendiville Catholic College to work with fellow students in making glass crosses, Christian Service Learning based activities, including preparing meals for The Shopfront, fundraising for LifeLink, and a group of students attending Ronald McDonald House to lead activities and assist the children residing there.